The club went out of June with very much a LOWLIGHT, all Sat sides lost. In no particular order by 39 runs, 117 runs, and 10 wickets. The 1sts made the short trip to K&D, on a boiling hot day, no doubt encouraged by the news that George Worker was playing in the Canadian T20 ! and when Baller removed his replacement, lbw for 1, things were looking good. James Ayres then bowled former Dorridge men Haley & Reddish. At 75-4 DCC seemed to be in a good position BUT Alex Phillips was still there and he carried the innings along until he was 7th out for an excellent 106 at 195-7. K&D were then boosted by 2 stands of 23 & 42 and closed at 260-8. Baller 4-67. In response Dorridge made a modest start and never looked to be on top of the excellent opening attack of Mottram & Grundy. Wickets fell regularly – stands of 15, 14, 15, 20, 2, 10, 26, 8, 1 — 111-9. James Harris (19) and George Seeley (11*) managed to delay the inevitable for 32 runs. All out 143. Lost by 117 runs. Jack Grundy 16-4-38-5. The 2nds entertained Kidderminster in a 2nd v 3rd clash, came 2nd and dropped to 4th. The visitors won the toss and decided to bat first, opening with Ahmed and Stainforth against the bowling of Jamie May and Rahim Khan. The batsmen got off to a fast start on a good track and with an outfield so dry that as soon as the ball went past the fielder, it went to the boundary. They raced to 41 in the fifth over before the bowlers thought that a little less pace on the ball might reap rewards. This was not to be however, although the scoring rate dropped so that the 100 was not attained until the 19th over. John Palmer was given the ball and soon had Stainforth (51) caught by Sam Smith when the score was 109. Ahmed had a very confident appeal for a catch behind by Grant Harrison off Palmer given not out by the neutral umpire, but a few overs later he fell lbw to the same bowler when he had scored a fluent 81 after adding 44 with Field. After Jonathan had tried three more bowlers, Craig Roberts was given two overs and he took two in two balls to leave KCC at 186-4 but captain Beadsworth (61) and Mitchell (23) took it on to 252 when Chris Leavers struck. He took the last four wickets to fall and they included two excellent stumpings by Grant Harrison. KCC ended on 294-8 with Leavers returning 4-53 in nine overs. Dorridge started as usual with Rhodes and Harrison and they made KCC’s openers look slow as the stand reached 50 in the 7th over. Rhodes had just struck a sweet six when he tried to do it again and was bowled for 39 when the score was 52. Usamah Khan came in and batted fluently and he and Grant put on 38 when Grant was bowled for 31 by Kirby-Davies who bowled a good tight line throughout his spell. Usamah and Sam Smith looked comfortable in adding 47 until Usamah (37) padded up to a straight one to be lbw at 137 but the arrival of Phil Henrick kept up the run rate and they added 47 when Sam (47) hit a full toss straight to cover to make it 181-4. The introduction of bowlers Vincent and Pountney slowed the scoring down and although Hooper (17) and Roberts (29) did all they could, the target was becoming further and further away. Dorridge needed 60 off the last five overs with only three wickets left and Leavers, deciding caution was the best way to earn some points from the side one place above us in the league, started playing for the draw. Jamie May batted the only way he knows and hit 12 off nine balls before having a rush of blood to the head and ran himself out when the score was 255. Leavers played out a maiden to the second last over and tried to get a single off the last ball but failed. Rahim lasted two balls and that was that. A defeat by 39 runs that was dragged from the jaws of an honourable draw. All the top seven batsmen got a start and victory was possible for quite a while, but we couldn’t cross the line. The 3rds achieved the “best” defeat of the day — 10wkts. Away at mid-table Moreton in Marsh, DHHCC batted like a side bottom of the league side, not top, and were blown away on a boiling hot day by A Hurrell (9-3-25-7) in 22 overs for 77. Moreton took just 10.5 overs to pass that for no loss. The side were without Muhammad Kamran, missing through illness, who has been a linch-pin in recent performances, but One Man does not a Summer Make !! Amazingly they have lost 2 of the last 3 games and are still top, but with more performances like this the side may start to go down the table. In place of a regular fixture our ever resourceful Sunday Social arranged a Club T20 game to fit around a Footy Match in Russia !! The 1sts failed again to set a competitive target, and were beaten by 6 wkts at home to second-bottom Barnt Green. Losing the toss and batting first Dorridge lost wickets regularly, their biggest stand being 34, and were all out 155 in over 48. Barnt Green lost an early wicket to Dave Ball, but then steadied things with some powerful hitting from Warwickshire Man Ed Pollock (35) and George Hargrave (65*). They reached their target in 37th over, 157-4. The 2nds won again and continued their climb up the table to 3rd place. Jonathan won the toss and elected to bowl and started with the usual pairing of Craig Roberts and Rahim Khan. The opening batsmen did not find much to worry about as Craig sprayed the ball about whilst Rahim, although beating the bat now and again, did not have enough pace to use the wicket to his advantage. Wilson and Styles had put on 52 when, in the 12th over, the former was bowled by Rahim for 27. Styles was then joined by 16 year old Blannin and they batted well together, punishing any bad ball. John Palmer was given the ball but like Craig was not accurate enough and so Jonathan turned to the slower bowling of Steve Hooper and Mark Saghabashi. They completely turned the tide of runs as first Blannin (50) was bowled by Mark at 125 and Hoops had Styles (61) lbw sweeping to make it 144-3. After that, only one other batsman got into double figures as the spin twins bowled Barnard’s Green out for 214 in the last over. Mention must be made of a superb reaction caught and bowled by Hoops which contrasted well compared to a bad day of attempted catching in the field. Hoops finished with 4-44 and Mark with 5-49. Dorridge’s opening bats of the skipper and Grant Harrison got off to the start we expect with some powerful hitting, especially to the short boundary on one side. They took the score to 77 in the 16th over when Jonathan was bowled for 37 (inc three 4’s and three 6’s). Jack Cullity came on to bowl and did so accurately, having Grant lbw for 43 and Chris Leavers (12) caught to make Dorridge 106-3. Sam Smith was batting solidly against Cullity and the spin of Monzur and his ability to stay at the crease was crucial as James Driscoll (14), Hoops (0) and Roberts (8) came and went to leave Dorridge on 149-6. For some strange reason, Cullity was then taken out of the attack and when Palmer came in he smashed five 4’s and a six in a quickfire 35 until he was caught when the score was 205, when the game was all over. Sam finished on a fine 39*. The 3rds recovered from last weeks loss and beat lowly Wellesbourne by 208 runs. Posting a very competitive total of 274-9 in their 45 overs (Ash Hussain 59, Mo Zaman 43 and Zubair Shah 41) DHHCC then swept aside WCC in 18 overs for 66. Muhammad Kaman 6-34 & Shabir Akhtar 3-12. Winning the toss and batting first, Dorridge got off to a flyer with 17 from the first over from Luke James. Luke would go on to make 123 (retired on 100 and then back for a few more at the end of the innings!). Luke was ably supported by several other players and particularly with a first ever 50 from James Driscoll. Dorridge finished on 298 for 9. This always looked to be a huge score to chase and a wicket in the first over from Tim Harrison made this even more difficult. Enter into the fray James Driscoll with a devastating spell of 8 overs 5 wickets for 11 runs, and 2 wickets from Ethan ‘golden arm’ Glynn, and Lapworth subsided to 130 all out giving Dorridge a very comfortable win by 168 runs. Excellent team spirit again and notable individual performances mean that the social team have now won 3 of their 4 matches. Happy days indeed!! The 2nds went to Rugby and came out on top by 4wkts after a close contest. Jonathan Rhodes won the toss and decided to bowl first. Rugby’s openers, Rathod and Lloyd, started well, although at times were beaten by the swing of Jamie May and the pace of Craig Roberts. They batted well though and were scoring at five an over, bringing up the 50 partnership in the 11th over before carrying on to 91 when, with the introduction of George Seeley to the attack, Rathod fell to a return catch for 45. This was in the 21st over so the opening two had scored at just over 4 an over. The scoring rate then dropped considerably and Lloyd (50) was caught by Grant Harrison off Seeley to make it 118-2. The rest of the batting seemed to bat as if they were seeing out the overs but wickets fell steadily. Seeley took two more quick wickets to make the hosts 126-4 in the 33rd over and when he repeated his first caught and bowled to dismiss Mitchell for a duck, he had earned his first senior ‘fivefor’. Evans (16) and Sage (24*) hit out at the end to enable Rugby to get to an unlikely 193-8 in their 50 overs. George returned the excellent figures of 15-6-34-5. Dorridge’s reply started with Rhodes and Harrison’s usual aggression and it was a surprise when Grant (18) was caught in the 8th over when the score was 36. The skipper was joined by Amar Rajgor who got off to a rusty start. They took the score to 66 when Jonathan (28) was out to be replaced by Sam Smith. He was unlucky when he absolutely middled two pulls, the first of which was dropped at mid-wicket whilst the second one was caught superbly by a diving Mitchell in the same position to make it 81-3. Phil Henrick (15) went at 124-4 and Amar and Roberts added 39 before Amar was caught for 58; after a controversial ‘not out’ decision was given for an earlier appeal for a caught behind. John Palmer came and went for 6 before Chris Leavers bludgeoned a quickfire 19 with four 4’s and Craig Roberts (25*) took Dorridge over the line for a valuable 20 points. The 3rds excellent run came to an end at Kenilworth Wardens, although they retained their position on top of Div 2. DHHCC were all out for 180 in the 44th over, Mohammed Zaman (37) and Rizwan Habib (33) and a late late show from No 9 Raheel Shah 61. The Wardens got a solid start 86-1, lost 2/3 wkts in the 130/140’s but were always in control and reached their target in the 43rd over. 183-5. Following on from last week’s winning game, Dorridge were invited to bat by a strong West Midlands Doctors team who were looking to repeat their win from last year. Despite the loss of an early wicket, our in form batsman Alex Smith played with fluency to amass 87 runs (an average for the Sunday Team of 136!!!) and was ably supported by Craig Roberts (59) and our newcomer Ben Stockdale with a very mature 25. There was temporary panic as huge hitting from Asim threatened to chase down the target (and lose the entire supply of cricket balls) but James Driscoll kept his nerve to have him excellently caught on the boundary by Luke James, ending any chance of victory. 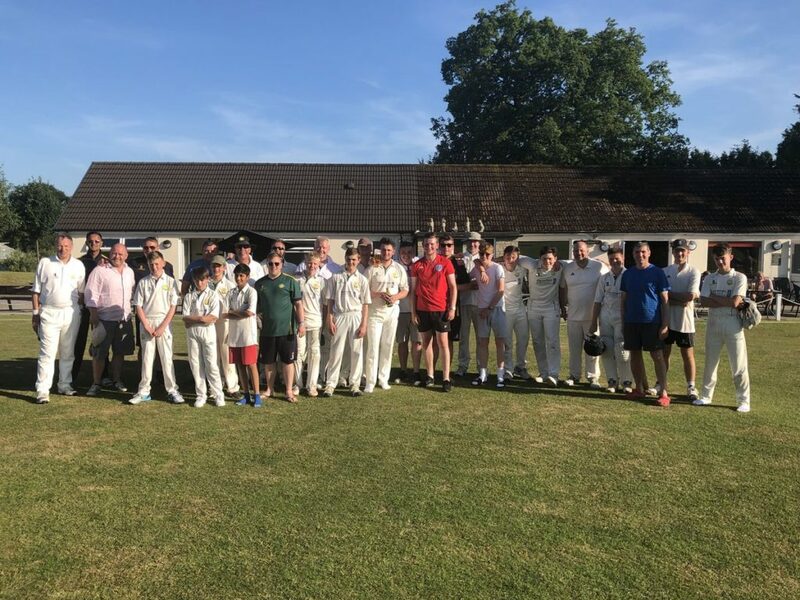 This was a fine win, played in exactly the right spirit against a team who were a pleasure to host – everything a Sunday Social Games of cricket should be!! After last Sat’s wins by both 1st & 2nd teams, this week they both lost. The 1sts again showed their brittleness “in the chase”, and the 2nds paid the price of not using up their overs. The 1sts won the toss and chose to field. They dismissed Kenilworth Wardens for 129 [Ali Ebad 4-56, Baller 3-31 and Joe Dodd 4 catches] and were probably feeling confident, but having struggled to “chase down” 104 last week, 130 could have felt like a real mountain to climb, and so it proved. Once again Aarib Khan showed his commitment to the cause before being run out for 31, but the rest of the top order failed and it was only Luke James (29) and last man out Ifti Ahmad (36) who made any sort of impression. 124 all out. Prerak Mankad 6-55. The 2nds at home to Stratford elected to bat, and whilst most got a start they lost wickets regularly. Jon Rhodes (24) and Grant Harrison (21) laid a reasonable foundation, but recent high-scorers Craig Roberts & Andy Dickinson both failed. Oldies Hoops (30) and Phil Henrick (20), back after surgery, steadied things, before Chris Leavers (40*) plundered some late runs. Problem was 187 all out in only 46 overs meant that they had failed to “use up their overs”, a Golden Rule broken. Stratford started steadily and again most got starts, and whilst DCC took regular wickets (Hoops 3-34) the target was never out of sight. Using up 54 overs SCC got over the line at 189-7. High flying Dorridge & Hockley Heath (the 3rds) won again having bowled out Norton Lindsey & Wolverton for 107 in 35 overs. Wickets shared nicely ! DHHCC were never really troubled although they contrived to lose 5 wickets in reaching 109. Rizwan Habib (36*) again making a significant contribution to the cause. The side have now taken over from NL&WCC at the top of Div 2. A triumph for Youthfulness! After the defeat to SportsmenCC and the frustration of a rained off game, Dorridge Sunday Social got back to winning ways with an away win in the beautiful surroundings of Alcester & Ragley CC. After winning the toss and electing to bat, Alcester & Ragley were batting smoothly until Kyle Trainer took a steepling catch to dismiss their club top scorer. Excellent accurate bowling from the young and ‘not so young’ continued to keep the scoring in check and take regular wickets with Alcester finally finishing on 106 for 9 from their 40 overs. 2 wkts a piece for Orton, Harrison and Trainer. In reply, a notable innings from Alex Smith who hit the first ball of the innings and the last ball of the innings, making 49 not out and carrying his bat: seeking a 4 for his 50 Alex and Graham Gilbert only managed to run 3 !! Dorridge reached their target with the loss of 4 wickets and nearly 10 overs to spare. This was a great team effort. It was really good to see significant contributions from our young cricketers – George Sitch, James Driscoll and Kyle Trainer. Everyone played their part in this win and made a contribution. 1sts beat Wolverhampton by 1 wkt. Bare details – WCC 104 allout, 5-fors for Ball & Wright. DCC 108-9, game over 5pm. In an amazing game Dorridge edged home against Wolverhampton by 1 wkt, having been 48-0. Winning the toss and bowling Dorridge were soon among the wickets as Dave Ball and Chris Wright wrecked the WCC top order. Baller 5-59 and Wright 9.4-2-15-5. Dorridge took tea in a confident mood little knowing what was to come ! Ali Ebad & Aarib Khan opened and were keen to finish proceedings quickly with 9 fours in their opening stand of 48, however Ali’s dismissal started a procession of wickets as the Wolverhampton bowlers warmed to their task. At 97-9 when James Harris joined James Hemstock few in the crowd were expecting a Dorridge victory, but the pair scampered singles and leg byes, gratefully accepted no balls and finally Hemstock punched a four through the covers. The crowd did cheer ! 2nds had a rather more comfortable victory, over Redditch, by 5 wkts. Choosing to bat Redditch lost early wickets but a stand by Gailey (56) and Eley (33) steadied the ship. Chris Leavers’ introduction to the attack changed things and his 14.5-4-26-5 saw RCC all out for 159. Dorridge had a steady start, with contributions from Rhodes (14) Harrison (13) Usamah Khan (24) but it was Luke James who really held things together and when he went for an excellent 71 at 133-4 the game was virtually won. Craig Roberts (25*) and Beef (7*) saw DCC home. 3rds were the third Dorridge winners of the day with another demolition job (see last week). DHHCC 281-6 v The Lenches 72. Dorridge chose to bat and although they were 16-3 they finished on 281 thanks to Andy Dickinson (81) Rizwan Habib (63) and Mohammed Zaman (61). The Lenches also lost early wickets but never recovered. Muhammad 10-4-11-5 doing the most damage.